HUNTER is an Alpha living a solitary life in the city of Dirge, getting by as a construction worker. Handsome. Strong. Hard-working. Hunter is a proud Alpha despite his ordinary life. YORK is the oldest Omega living in a Pandora shelter. He has to do everything he can for himself as well as the other Omegas in the orphanage just to make ends meet. One night, Hunter decides to head to the slums to earn some extra money for himself. Hunter runs into York and takes a chance on the Omega. What was supposed to be one night of passion turns into something more. When Hunter learns more about York, he can't help a desire to do everything he can to help the Omega who's down on his luck. Hunter suddenly finds himself facing tasks greater than he ever expected. At the same time, York must decide between his feelings for Hunter and his obligations to his orphanage. Can the two of them face the challenges that continue to come up before them? Will Hunter finally become the Alpha he was meant to be? Will York be able to save the orphanage he spent all his life in? Or will both of them have to give up and face the harsh realities of living in the city of Dirge? 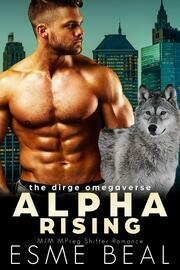 ALPHA RISING is a STEAMY standalone paranormal shifter romance. It features a strong Alpha and a loving Omega. There are no cliffhangers and no cheating. Happy ending? Check inside to see! Mature readers only!